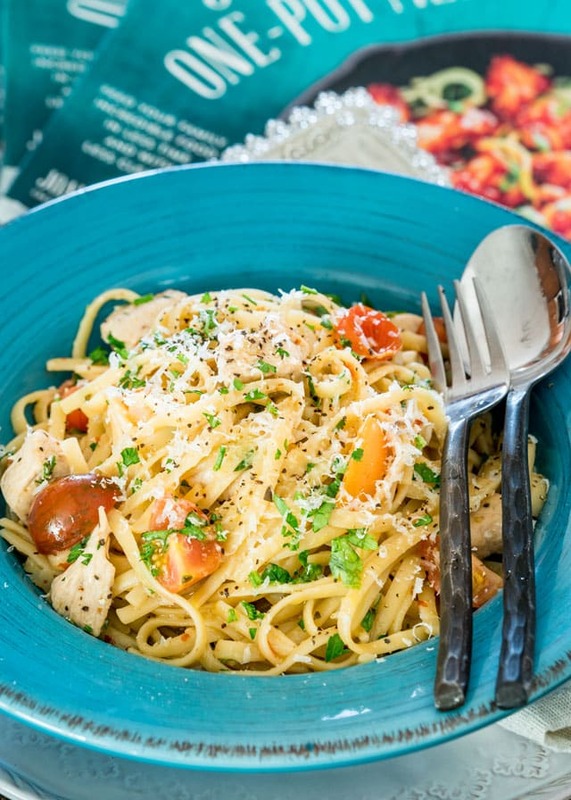 This Jacked-Up Chicken Scampi with Linguine is my fresh take on a classic Italian dish. This chicken scampi bursts with mouth-watering flavors. I wanted to take the time and share with you another one of my many favorite recipes from my cookbook and to thank you all for all your support. As a small token of my appreciation, I also wanted to give away another 5 signed copies of my book to 5 lucky readers. But we will get to that in a minute. 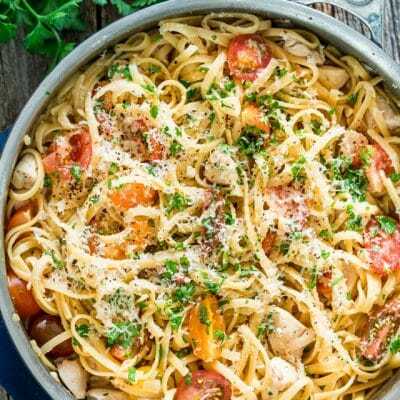 This jacked-up chicken scampi is my version to the famous Italian dish which is traditionally made with shrimp, but I chose to make this with chicken instead to give you guys a more affordable option. 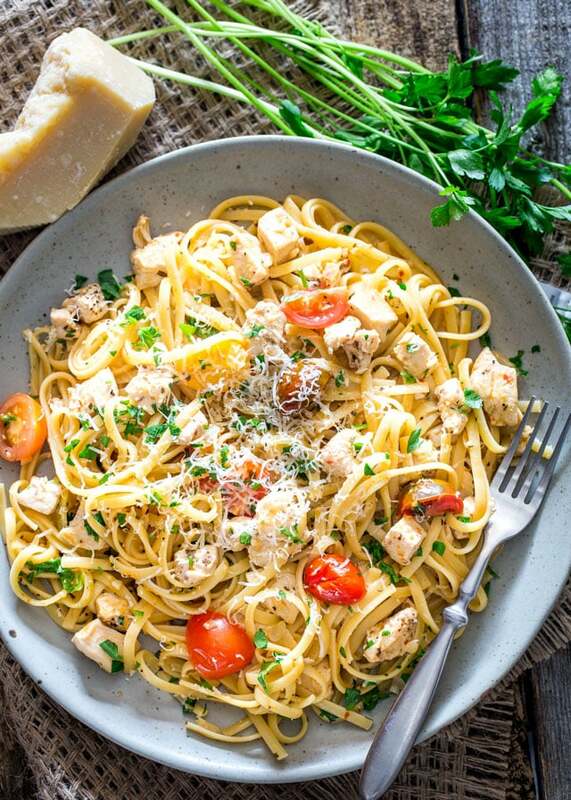 Of course, the great thing about this dish is that you make it all in one pot, pasta and all. But then let’s not forget the great flavors! The chicken is infused with butter, lemon juice, lots of garlic, some red chili flakes and oregano. 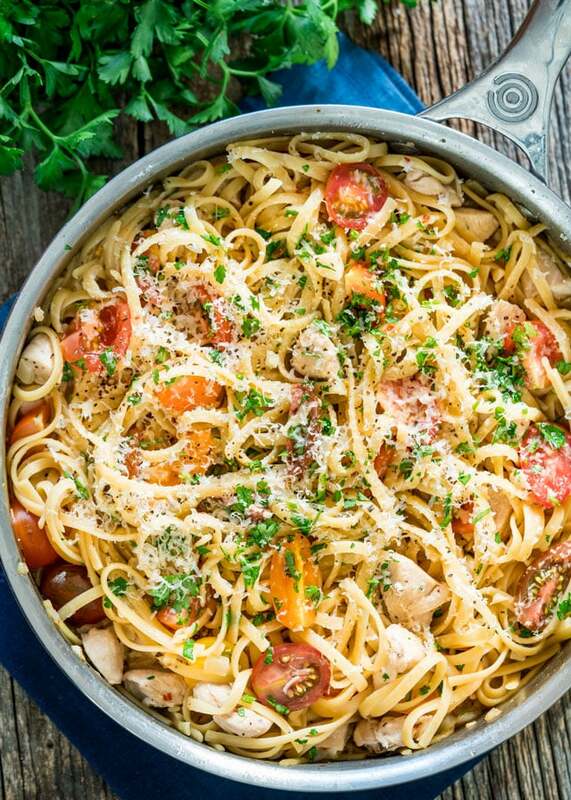 It’s then cooked in white wine and chicken broth with linguine then tossed with fresh cherry tomatoes and parsley. Finally it’s served with some freshly grated Parmesan cheese. It’s a really simple dish, but perfect for any occasion, romantic or not, plus it’s the ideal dish for a busy weeknight dinner. This is just a small example of the many such easy 30-minute recipes in my cookbook. For another great recipe from the book, don’t forget to check out the Quick and Easy Green Chile Chicken Enchilada Casserole which can also be on your dinner table in 30 minutes. 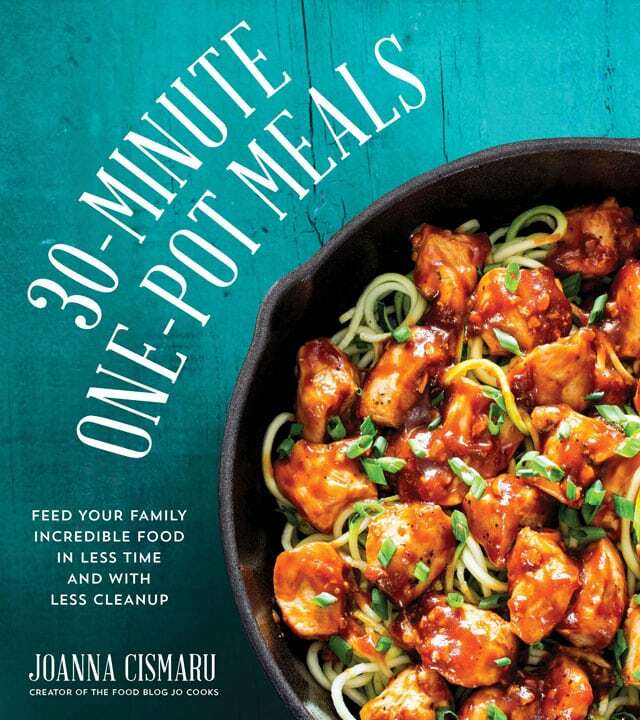 Because I love you all and really appreciate you guys for all the nice comments and emails you guys have left me, I’ve decided to give away another 5 signed copies of 30-Minute One-Pot Meals, to show you my appreciation. To enter, all you have to do is leave a comment below and tell me the answer to this question: What is your favorite Thanksgiving dish? Contest is open to EVERYONE in US and Canada and will run until midnight Thursday November 10, 2016. This contest is now CLOSED and winners have been selected and notified. Melt the butter in a large pot over medium-high heat. Add the chicken and cook until no longer pink, about 5 minutes. Add the onion, garlic, oregano and red pepper flakes to the pot and cook for 5 more minutes, or until the onion begins to soften and becomes translucent. Add the wine, chicken stock, hot sauce, lemon juice and linguine. Cook, stirring occasionally, for about 8 minutes, or until the linguine is al dente. If you feel that more liquid is necessary, add 1/2 cup of chicken broth at a time until the pasta is cooked to your preference. Stir in the tomatoes and garnish with parsley and Parmesan cheese. This is relatively a very spicy dish. To reduce the amount of heat, just cut down the amount of red pepper flakes or hot sauce used. I can’t wait to try this dish! I love shrimp scampi, but that’s not in my budget – this will satisfy my cravings! I know I’m boring, but I love my grandmother’s recipe for mashed turnip (which is really rutabaga) She boiled the cut up turnip in chicken stock, and mashed it with butter, cream cheese and nutmeg. Great “Scampi” recipe & I have now tried it with the chicken as well as a second batch with shrimp! So easy & so special. Thanks for sharing. This recipe is worthy of competition in the great State Fair of Texas culinary competitions. Stay tuned; lol! About Thanksgiving…love it all but especially the dessert including the Julia Child recipe for her Aunt’s poufy, boozy pumpkin pie.